Many hospitals struggle with denials management thanks to the complex regulations and various types of denials. Payers often send denials to the wrong person, and hospitals may lose valuable research and appeals time as a result. In addition, drafting effective appeals letters that follow Medicare’s regulations can be time-consuming and difficult even for experienced staff. Worst of all, the hard work of managing denials and submitting appeals on the back end can all be wasted if there is no system to use denials data to address root causes on the front end. 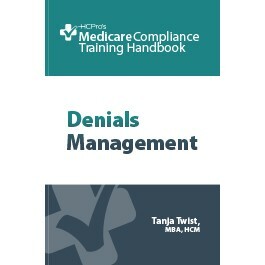 The Denials Management Training Handbook provides clear, concise explanations of the complex appeal guidelines for Medicare and other payers. This information is presented in an easy-to-understand handbook for distribution to staff members involved in preventing and handling appeals. Tanja Twist, MBA/HCM, has over 25 years of experience in healthcare revenue cycle management, with a focus on reimbursement and denial management. Twist has served as director of patient financial services and overall operations officer for large and small hospitals, as well as professional providers and provider groups. She advocates for hospitals and providers nationwide, providing revenue cycle management services supported by a deep knowledge of state-specific issues and unparalleled expertise in Medicare, Medicaid, and commercial reimbursement. Twist has a bachelor’s degree in business management and a master’s degree in business administration with a certification in healthcare management. She is a nationally recognized speaker on governmental recovery programs, commercial denials, and best practices to avoid audits. Twist is on the board of the Western Region Chapter of the American Association of Healthcare Administrative Management, was a board member for the Workgroup for Electronic Data Interchange, and is an active member of the Southern California chapter of the Healthcare Financial Management Association.